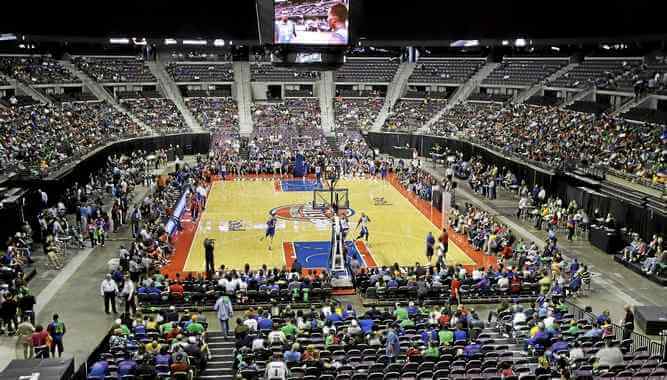 The Palace of Auburn Hills (commonly referred to as The Palace) is a sports and entertainment venue in Auburn Hills, Michigan, a suburb of Detroit. Opening in 1988, it is the home of the Detroit Pistons, of the NBA. From 1957 to 1978, the Pistons competed in Detroit’s Olympia Stadium and Cobo Arena. In 1978, owner Bill Davidson elected not to share the new Joe Louis Arena with the Detroit Red Wings, and instead chose to relocate the team to the Pontiac Silverdome, a venue constructed for football, where they remained for the next decade. While the Silverdome could accommodate massive crowds, it offered substandard sight lines for basketball viewing. A group led by Davidson bought vacant land in Auburn Hills from Joseph Shewach and built The Palace there for the relatively low cost of $70 million, using entirely private funding. The Davidson family held a controlling interest in the arena until Tom Gores purchased majority share in 2011.